Shadow Mountain offers some of the best views of the Tetons and provides excellent backpacking, hiking, and mountain biking opportunities. The best views of the Tetons aren’t in the Tetons. They’re across the valley. Shadow Mountain, north and east of Blacktail Butte and in the Bridger-Teton National Forest and the Gros Ventre mountains, is one of my favorite spots from which to ogle the Tetons. Best of all? You can ogle while riding beautiful single-track or with a cocktail in hand in front of a campfire while car camping. Or you can do both. 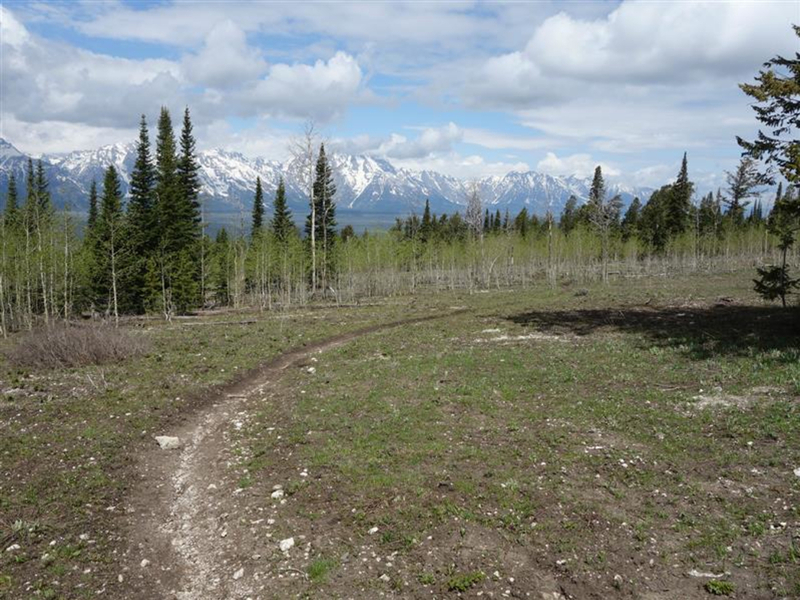 Although Shadow Mountain itself is in the BTNF, the road and some of the campsites at its base are in Grand Teton National Park. But I don’t think the park counts these as theirs. Camping at Shadow most recently, a NPS boundary sign indicated half of our site was in the park and half was not. 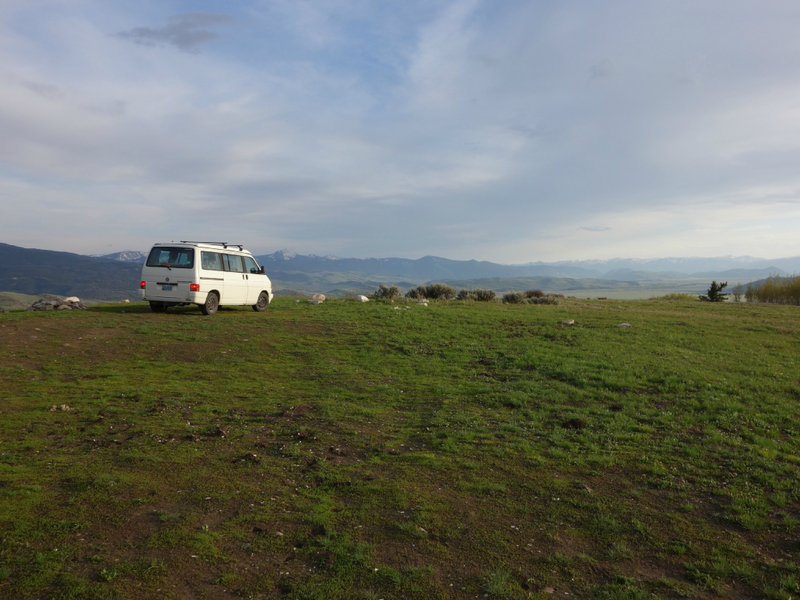 Technically, our van was parked on the grass in GTNP and the world’s cutest yellow lab was frolicking sans leash in GTNP. Even if part of it is in the park, Shadow Mountain seems to be wholly national forest. Undisputedly, it has national park views though. I have a favorite Shadow Mountain campsite. It’s almost at the peak’s rounded summit, about 1,500 feet above the valley floor. While you're camping, there's plenty of great views. There's also great bike-from-camp options. There’s a great single track trail for mountain bikers at Shadow Mountain. From the bottom, you ride up the dirt road to the very top. (From this recommended campsite, it’s about a 10-15 minute ride uphill at the start, then you’ll do the downhill and then you’ll ride 20-25 minutes up the road back to your campsite.) Whenever in your ride you do it, the uphill part is sustained with more pops of steepness than sections of flat. The downhill—all single-track—isn’t technical, but, as a super-wuss when it goes to going down, I walked a couple of sections steeper than I was comfortable with. There are not any loose sections. Roots and rocks are minimal, which is good because you’re tempted to look up and out at the Tetons rather than at the trail in front of you. The trail wends through aspen and pine. 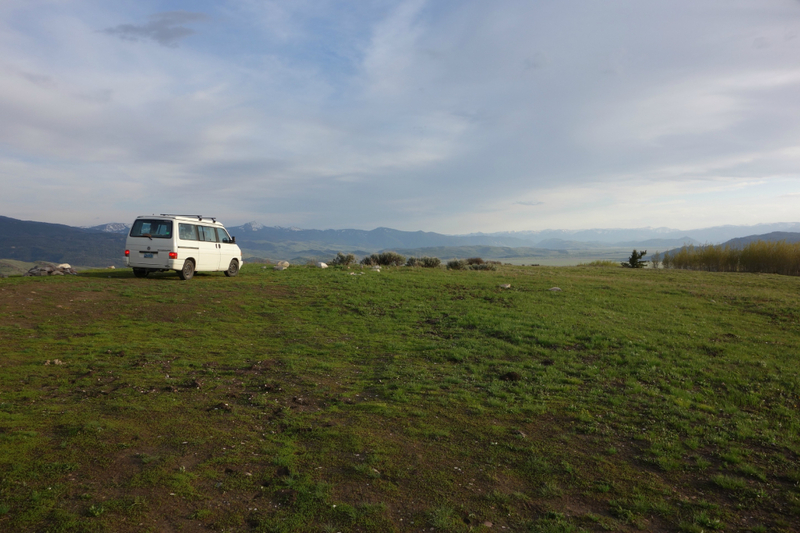 Anyone looking for car camping with epic views, this is your place. Tacking on some biking, hiking and other activities is easy. It's a great place to get out and see the Tetons from a distance. As you drive up Shadow, which does not require four-wheel drive, but has some sections where drivers of low-riding cars have to be careful, there are several beautiful spots. About one-third of the way up, there’s a campsite out on a promontory. As tempting as that one looks, there is a better one higher. Round a gentle curve about 1,000 feet above the valley floor and the road flattens out. For a bit. The mountain is open to the east. On your left, stands of aspens jiggle and shimmy in the slightest breeze. You’ll pass one site on your right with some sort of official sign—about how to prevent wildfires or something. That’s a great site, but it’s the next one that is spectacular: oversize rock fire pit; wonderfully flat; and 270-degree views including the Tetons, Jackson Peak and the Gros Ventre slide.To get to Shadow Mountain, turn onto Antelope Flats Rd. just north of Moose. Past Mormon Row, when Antelope Flats Rd. intersects the Gros Ventre Rd., turn left onto GV Rd. In several miles, this road turns from pavement to dirt. This dirt road is the one that follows the base of the mountain. When it forks less than one-mile after the pavement ends, the right fork climbs up Shadow Mountain. Because it is in national forest, no camping permits are required. Also, camping is free. There are no services or pit toilets. Most sites do have a fire ring though.